*This is post 1 in the Why We Were Created Series. See bottom for full list. The mainstream fitness media screws you out of long-term results and happiness because it completely avoids talking mindset around your food, your exercise, your life, and yourself. Your mind controls EVERYTHING you do. And the way these companies market and push their products actually INCREASES your poor mindset around all of those things-this keeps you struggling and “needing” to come back for their products. This is because they are selling you rules. Just FYI, there ARE amazing people in this industry talking mindset. Hence reason #1 why Brainy Betties was born: Mindset Around Food. Not while being happy at least. Why? Many times people subscribe to food rules to try and get a grip on their food intake (and this works in the short-term!). But, really this is just putting Band-Aids on underlying issues. And this is why eventually they end up failing. You can push through something for a while, but in the end, the real you/problems with your food re-surface. For long-term results, you need to create a relationship with food that isn’t relying on willpower. This is one where you understand how different foods/food combos affect your body and cravings. And one that deals with underlying mindset issues (all or nothing, situational eating, shame/overeat cycle. You NEED to have a healthy relationship with food to be successful long-term. You can live in a bubble for a while. But, once real life hits, you’re screwed. You’re living in a bubble because living by rules doesn’t allow you to adjust to the normal ebbs and flows of real life: stress, lack of sleep, tight schedule, emotional rollercoasters etc. If you aren’t dealing with your actual relationship with food (mindset) you aren’t able to deal with life’s normal ebbs and flows. All things that are normal, that you WILL encounter, and will pop your bubble. When these food rules fail you, it makes you feel like a loser and that you’re the reason you aren’t successful. And each time you are unsuccessful, it makes it harder to be successful in the future just because you think you can’t be. Even though this isn’t true. But, try telling your brain that when it feels like it’s tried EVERYTHING in the past and has been unsuccessful. Many times when people start a fitness program or a diet, their food and exercise are very much psychologically linked. As you can see, when your food is linked to your exercise (in any way other than fueling your workouts) it can be detrimental. Especially when our relationship with food is based on rules and ‘black and white’/ ‘all or nothing’ thinking because it’s just too easy to be derailed. We are not compartmentalized beings. One thing affects the other and that thing effects something else. I think this point is pretty straight forward, but I will point it out anyways. When something is derailing your food, exercise, and how you feel about yourself as a whole, it’s obviously going to impact the quality of your whole life. Thinking that these diets and food rules are the only way to get healthy can lead us into a life of yo-yoing with our weight, on and off exercise cycles, poor self-image etc. Adding this all up can lead to life of poor physical health. Or at the very least, less than what we are capable of and deserve. 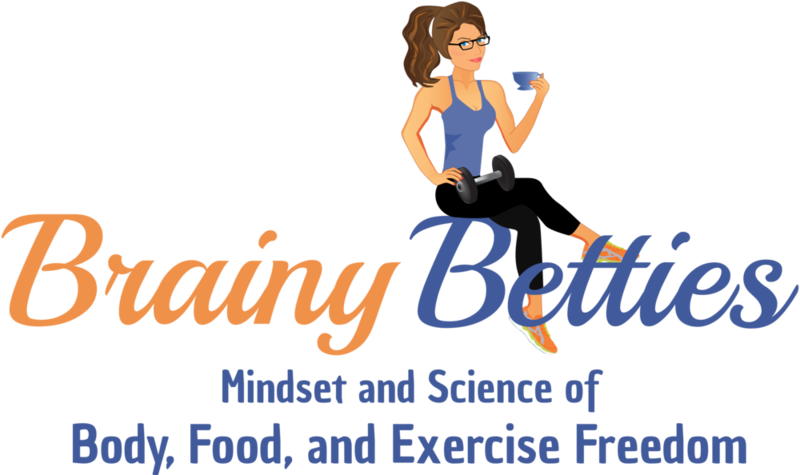 One of the many reasons Brainy Betties has been created is to help women with their relationship with their food so they can be Fit AND Happy for the rest of their lives. Click here if you want to work on your relationship with food so you can be Fit AND Happy! *I will be writing the rest of this series in the upcoming weeks.